Heat oven to 350°F. Grease bottom, side and tube of 10x4-inch angel food cake pan (tube pan), 12-cup fluted tube cake pan or two 9x5-inch loaf pans with shortening; lightly flour. In medium bowl, mix flour, baking powder and salt; set aside. In large bowl, beat granulated sugar, butter, vanilla and eggs with electric mixer on low speed 30 seconds, scraping bowl constantly. Beat on high speed 5 minutes, scraping bowl occasionally. Beat flour mixture into sugar mixture alternately with milk on low speed, beating just until smooth after each addition. Pour into pan(s). Bake angel food or fluted tube cake pan 1 hour 10 minutes to 1 hour 20 minutes, loaf pans 55 to 60 minutes, or until toothpick inserted in center comes out clean. Cool 20 minutes; remove from pan(s) to wire rack. Cool completely, about 2 hours. Sprinkle with powdered sugar. Substitute 1 teaspoon lemon extract for the vanilla. Fold 1 tablespoon grated lemon peel and 1/4 cup poppy seed into batter. This classic cake’s name is a bit of a relic — original recipes called for it to be made with a pound each of butter, sugar, eggs and flour. We’ve refined that concept into an ideal recipe that captures the buttery flavor, dense texture and just-right sweetness that everyone looks for in a pound cake. Whether you’re a seasoned baker or eager to learn how to bake a cake for the first time, this is one to master because it’s so versatile. 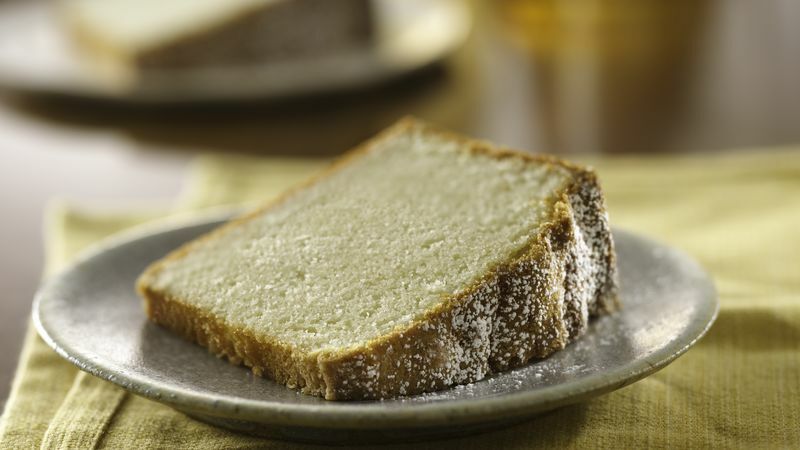 Whatever the occasion, pound cake is always welcome — and when you’re ready to bake outside the basics, we have plenty of pound cake recipe variations to keep you busy in the kitchen!